Can assist you when there is a possibility of your vehicle colliding with a vehicle detected in front of yours. The CMBSTM is designed to alert you when a potential collision is determined, as well as to reduce your vehicle speed when a collision is deemed unavoidable to help minimize collision severity. 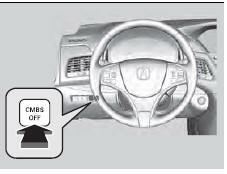 The CMBSTM is designed to reduce the severity of an unavoidable collision. It does not prevent collision nor stop the vehicle automatically. It is still your responsibility to operate the brake pedal and steering wheel appropriately according to the driving conditions. 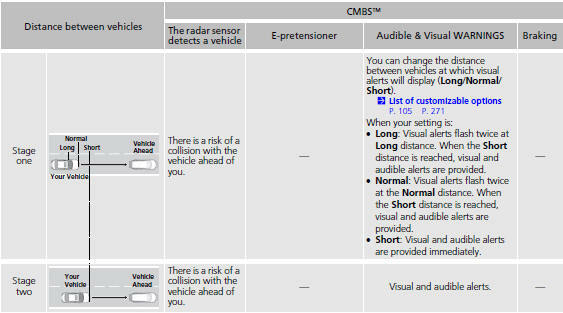 The CMBSTM may not activate or may not detect a vehicle in front of your vehicle under the following conditions: • The distance between your vehicle and the vehicle ahead of you is too short. • A vehicle cuts in front of you at a slow speed, and it brakes suddenly. • When you accelerate rapidly and approach the vehicle ahead of you at high speed. • The vehicle ahead of you is a motorcycle or other small vehicle. • A vehicle suddenly crosses in front of you. • When you drive on a curved or winding road that makes it difficult for the sensor to properly detect a vehicle in front of you. • When there are pedestrians or animals in front of your vehicle. 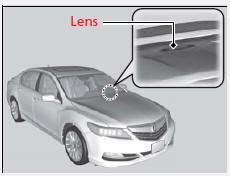 The heads-up warning uses a lens located at the front end of the dashboard. Do not cover the lens or spill any liquid on it. 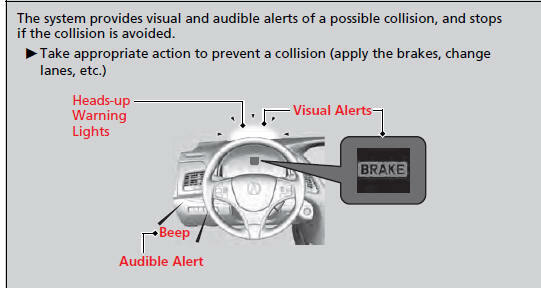 The system has four alert stages for a possible collision. However, depending on the circumstances, the CMBSTM may not go through all of the stages before initiating the last stage. Press this button for about one second to turn on and off the system. When the CMBSTM is off: • The beeper sounds. • The CMBSTM indicator in the instrument panel comes on. • A message on the multi-information display reminds you that the system is off. The CMBSTM is in the previously selected ON or OFF setting each time you start the engine. The CMBSTM may automatically shut off, and the CMBSTM indicator will come and stay on when: • You drive off-road or on a mountain road for an extended period. • You drive with the parking brake applied. • The radar sensor cover is blocked by dirt, mud, dry leaves, wet snow, etc. • An abnormal tire condition is detected (wrong tire size, flat tire, etc.) Once the conditions that caused the CMBSTM to shut off improve, the system comes back on. Your vehicle approaches another vehicle ahead of you and you change lanes to pass. Your vehicle approaches or passes another vehicle that is making a left or right turn. 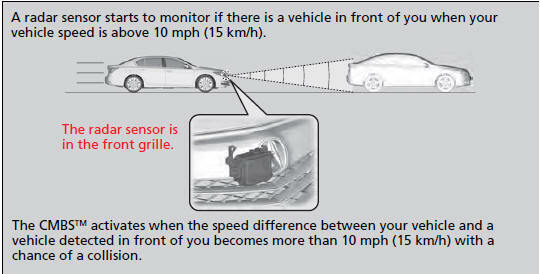 You drive under a low or narrow bridge at high speed. ■ Speed bumps, road work sites, train tracks, roadside objects, etc. You drive over speed bumps, steel road plates, etc., or your vehicle approaches train tracks or roadside objects [such as a traffic sign and guard rail] on a curve. Avoid the following conditions that may cause the radar aim to be temporarily out of range and prevent the CMBSTM from working properly. • A heavy load in the rear or modifications to the suspension tilts your vehicle. • The tire pressures are not correct, the tire sizes are incorrect, the tire types are different, and/or the tires are not in good condition. For the CMBSTM to work properly: Always keep the radar sensor cover clean. Never use chemical solvents or polishing powder for cleaning the sensor cover. Clean it with water or a mild detergent. Do not put a sticker on the emblem or replace the emblem. Take your vehicle to a dealer if you need the radar sensor to be repaired, or removed, or the radar sensor cover is strongly impacted.